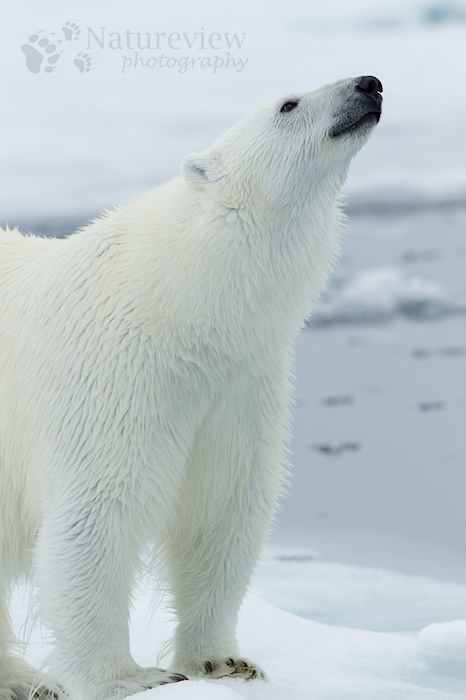 Polar Bears have an extraordinary sense of smell. They can smell a seal pup under a layer of snow/ice from over 1 kilometre in distance. When a Polar Bear roams the ice in search of food, this sense of smell is their most important sense. If a bear has smelled something, you often see him raise his head to be able to sniff better (like the bear in above picture). When we’re in the ice with our ship, it sometimes happens that bears get interested by us. The ship smells different as he’s used to (or maybe the chefs are just preparing a new meal) and they become curious if we’re edible. To them we probably look like a huge can of food and they wonder how to open it… Of course we won’t give them any food (we’re not even allowed), so after a while they get bored and move on to something more tasty. From these meetings we had during one afternoon in the past season I’ve also made a movie. You can view it here (watch in HD and full screen). All I can say is thank you for sharing this. Absolutely amazing. I really hope the climate change will not mean this species is doomed. Magnficient (and dangerous) creatures.